Main purpose of this report is to identify the major products of General banking practiced by Al-Arafah Islami Bank at Dhanmondi Branch and its competitive performance from the year 2007 to 2008. Report also focus on to know about Islami banking system in our country. Finally make possible recommendations for the internship organization to improve the services and service range so that the department can cater to the needs and demands of customers. 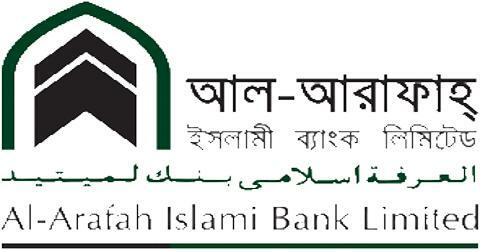 To identify the major General banking products of Al-Arafah Islami Bank Ltd.
To understand the General banking products used by the Dhanmondi Branch of Al-Arafah Islami Bank Ltd.
To identify and evaluate the financial and competitive performance general banking products from the year 2007 to 2008. To make possible recommendations for the internship organization to improve the services & service range so that the department can cater to the needs and demands of customers. Al-Arafah Islami Bank Ltd. annual reports, Al-Arafah Islami Bank Ltd.product brochures, Al-Arafah Islami Bank Ltd., Dhanmondi Branch statement of affairs, Al-Arafah Islami Bank Ltd., Dhanmondi Branch monthly reports, Al-Arafah Islami Bank Ltd. website etc are the source of secondary information. Financial institution/ intermediary that mediates or stands between ultimate borrowers and ultimate lenders is knows as banking financial institution. Banks perform this function in two ways- taking deposits from various areas in different forms and lending that accumulated amount of money to the potential investors in other different forms. General banking department aids in taking deposits and simultaneously provides some ancillaries services. It collects money only its receipts forms. Account opening section is an important factor for banks because customer is the main source of bank. Selection of customer is another important factor. Bank’s success and failure largely depends on their customers. If customer is not good then may create fraud and other problems by their account with bank and thus destroy goodwill of banks. Therefore, bank must be conscious in selecting its customer. For this reason Al-Arafah Islami Bank Ltd. keep key information system. Accounts opening information that is collected by the Al-Arafah Islami Bank Ltd. varies for each type of account. One photograph of the nominee duly attested by the account holder. If any account is inoperative for more than one year is called dormant account. To operate these accounts manager permission is necessary. Bank receives all kinds of cheque in favor of the client for clearing. When cheque is received it is necessary to endorse it and cross it specially. Inward Clearing Cheque Cheque received from the clearing house of Al-Arafah Islami Bank Ltd. Party’s A/c…Dr. Al-Arafah Islami Bank Ltd. General A/c…Cr. (Outward Bills for Collection) Cheques of other branch of Al-Arafah Islami Bank Ltd. within its clearing house area. These cheques are directly sent to the respective branch and request them to sent IBCA. When it comes, then customer’s A/c is credited for the cheque. Clearing Cheque Cheques another bank within Al-Arafah Islami Bank Ltd. clearing house area. These cheques are sent to clearing house via Dhanmondi Branch. When drawee bank honor the cheques, then the account of cheque depositors are credited. outside the clearing area If any branch of Al-Arafah Islami Bank Ltd. exists within the clearing house area of drawee bank then Al-Arafah Islami Bank Ltd. send the cheque to that branch of Al-Arafah Islami Bank Ltd. and sends IBCA to it. From another bank outside the clearing house These cheques are settled debiting depositor’s account and sending DD, MT, TT in favor of sender’s bank. This chapter bases on graphical analysis of deposits for some general banking products of Dhanmondi Branch and their comparative situation from the year 2007 to 2008. Comments: From the above graph it is observed that total deposit of Dhanmondi branch increased from 2007 to 2008 compare with 2007 about the increasing rate is 25.27%. This growth is mostly influenced by the deposit accounts of Mudaraba Lakhapoti Deposit Scheme, Mudaraba Millionaire Deposit Scheme, Mudaraba Kotipoti Deposit Scheme and P/P Term Deposit Scheme. Comments: From the above graph it is observed that total Al-Wadia current deposit of Dhanmondi branch decreased from 2007 to 2008 compare with 2007 about the decreasing rate is 2.86%. This is happened as the number of accounts had been decrease in 2008. Comments: From The above graph it is observed that total Mudaraba Saving Deposit of Dhanmondi branch increased from 2007 to 2008 compare with 2007 about the increasing rate is 17.41% and is a strength for the branch of Al-arafah Islami Bank Ltd. Comments: From The above graph it is observed that total Mudaraba Term Deposit of Dhanmondi branch increased from 2007 to 2008 compare with 2007 about the increasing rate is 23.30%. The year 2008 was a flourishing year for this scheme at Dhanmondi branch and no. of new accounts were also satisfactorily high. Comments: From The above graph it is observed that total Installment Term Deposit of Dhanmondi branch increased from 2007 to 2008 compare with 2007 about the increasing rate is 23.58%. Comments: From The above graph it is observed that total Savings Investment Deposit of Dhanmondi branch increased from 2007 to 2008 compare with 2007 about the increasing rate is 3.53%. Comments: From The above graph it is observed that total P/P Term Deposit of Dhanmondi branch increased from 2007 to 2008 compare with 2007 about the increasing rate is 9.97%. Comments: From The above graph it is observed that total Monthly Hajj Deposit of Dhanmondi branch increased from 2007 to 2008 compare with 2007 about the increasing rate is 56.14% and respondents for this scheme was also frequent and good. Comments: From The above graph it is observed that total Special Pension Deposit Scheme of Dhanmondi branch increased from 2007 to 2008 compare with 2007 about the increasing rate is 35.29%. Comments: From The above graph it is observed that total Mudaraba Lakhopoti Deposit Scheme of Dhanmondi Branch increased from 2007 to 2008 compare with 2007 about the increasing rate is 204.81%. It was remarkable for this scheme, at its second year after lauching the Mudaraba Lakhopoti Deposit Scheme in Dhanmondi Branch, Al-arafah islami Bank Ltd. and the reason for that is the Islamic philosophy of the bank for deposit account profit. Comments: From The above graph it is observed that total Mudaraba Millionaire Deposit Scheme of Dhanmondi branch increased from 2007 to 2008 compare with 2007 about the increasing rate is 205.97%. It was also remarkable for this scheme, at its second year after lauching the Mudaraba Millionaire Deposit Scheme in Dhanmondi Branch, Al-arafah islami Bank Ltd. and the reason for general public awareness towards the Islamic philosophy of the bank for such deposit accounts. Comments: From The above graph it is observed that total Mudaraba Kotipoti Deposit Scheme of Dhanmondi branch increased from 2007 to 2008 compare with 2007 about the increasing rate is 183.93%. Same type of comment goes for the Mudaraba Kotipoti Deposit Scheme like the other two fixed deposit schemes of the branch. Not surprisingly, in the competitive arena of marketing era it is must to analyze the major strength and weakness factors based on product, price, place and promotion of a financial institute like private bank. Strength and weakness includes the internal factors which are prevailing inside the concern/organization.